Market researcher Kantar Worldpanel reckons Apple has grabbed a bunch of smartphone sales share across a number of country markets thanks to the popularity of the redesigned iPhone 6, although the 6 Plus is nowhere near so popular. Kantar analysed sales data for the quarter concluding at the end of October and found that Apple gained a dramatic ten percentage points of smartphone sales share in the Britain, accounting for almost 40% of all smartphones sold in that period. Us Brits, it seems, have gone mad for the new design and larger screen of the iPhone 6. This trend continued across the whole of Western Europe, albeit to a less dramatic extent, as illustrated in the table below. The average increase in Apple market share across Britain, Germany, France, Italy and Spain was nearly six percentage points, although iOS handsets are twice as popular in Britain than average. Kantar’s own numbers reveals Apple’s share of the world’s two biggest smartphone markets – China and US – was almost static, while its share of Japan plunged by 13 percentage points, albeit from a very high level. So the claim of a huge jump across almost all major markets seem slightly overblown, but it definitely seems to have been a good quarter for Apple. Things could look even better for Apple in the next month or so as it only started selling the iPhone in China half way through the month. Larger handsets are especially popular in the Far East, so the 6 Plus could be set to do well there, although Xiaomi is an increasingly aggressive competitor. The main reasons British shoppers gave for choosing the iPhone 6 were 4G capability (51%), screen size (49%) and design (45%). 31% of iPhone 6 sales in Great Britain were sold directly through Apple’s retail offer, which was apparently an increase over a year ago, and the iPhone 6 outsold the 6 Plus by a 4:1 ratio there. 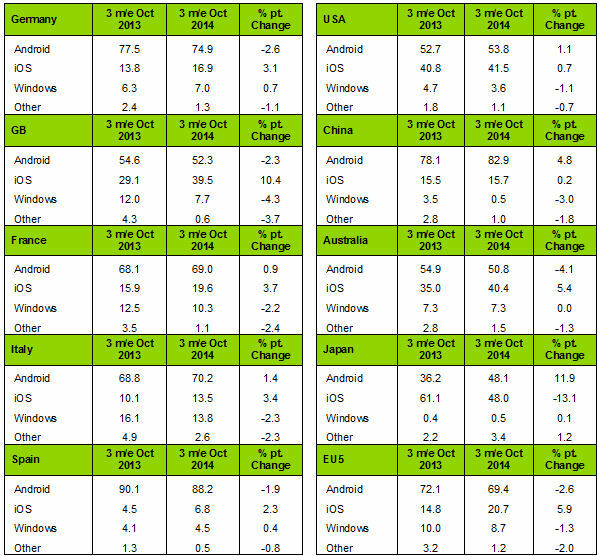 While it’s not quite a two-horse race, Android dominates the rest of the market. BlackBerry’s sales are negligible in many markets while Windows share continues to decline almost everywhere and is close to zero in China.